After the housing bubble burst, real estate prices crashed nationwide, and crashed hard. Except in New York City, that is. National media outlets have followed rising rents in Manhattan, then Brooklyn, and now Queens, where rent and home prices continue to reach truly epic, meteoric heights (and show no signs of stopping). So where did they end up? Where else — Jersey City. They’re not the only ones fleeing impossibly high New York City prices this year. Even one percenters are moving to the Garden State; five of Forbes’ Top 400 Richest People in America live in New Jersey, too. Plus, national corporate housing companies say the city is increasingly a popular destination for companies looking to house employees relocating to New York City. 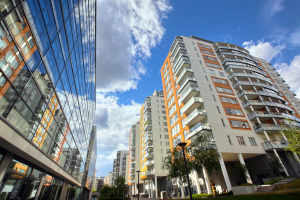 What is corporate housing? Is that like a hotel? National corporate housing companies provide stylish, fully furnished apartments, condos, or homes for rent to people who need temporary living space. And according to data from national corporate housing companies, 32% of visitors in Jersey City corporate housing stay because of relocation for work. About 20% stay in Jersey City short term rentals while undergoing training or an ongoing business project. The best corporate housing NJ has to offer features amenities like pools, washer and dryers, gyms, and other luxury services not usually found in sketchy extended stay hotels. Many also take pets. The Brooklyn couple who settled happily into a Jersey City condo were shocked to find that they actually had ashorter commute into the city than they did from Brooklyn. They also didn’t have to sell their souls to afford Greenpoint rents and home prices. Like the real estate market, many businesses and workers are discovering national corporate housing companies in Jersey City offer better deals than Manhattan or Brooklyn alternatives. So if you strike out in the New York City corporate housing market, consider checking out one of the many national corporate housing companies offering short term rentals in NJ.